During the tumultuous period called Reconstruction (roughly 1865-1877), some of the South's own took advantage of the situation to pad their pockets. Some did so in partnership with northerners who had come south to loot. The southerners were called Scalawags, and the northerners were called Carpetbaggers. They were associated with the Radical Republicans and the Freedmen's Bureau. One of the most notorious Scalawags was a fellow named George William Swepson (1819-1883). Born in Mecklenburg County, Virginia, he had moved to Caswell County, North Carolina, by 1842 and was listed in the 1850 United States Census (Caswell County) as a farmer with real estate worth $9,000. By the time of the next census in 1860, Swepson was living in Alamance County, North Carolina, still listed as a farmer, but now with $4,500 in real estate and $65,000 in personal property. Before his death in 1883, Swepson had moved to Raleigh, Wake County, North Carolina, and described himself as in "manufacturing." . . . . [George W. Swepson] became one of the chief Scalawags of the Reconstruction period. 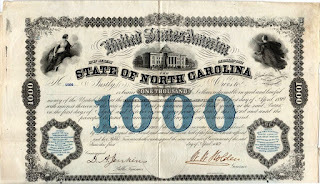 His machinations in railroad bonds contributed in large measure to the financial ruin of the state. He and his carpetbagger friend, Milton S. Littlefield . . . displayed open contempt for constitutional restrictions. As president of a railroad Swepson openly bought votes in elections, and he gave away railroad stock that had been secured by state bond issues. His business connections were vast and involved. He was president and majority stockholder in a Raleigh bank, controlled a large bank in Columbia, South Carolina, and had banking interests elsewhere. He owned a cotton mill, was a wholesale distributor of liquor, engaged in general wholesaling, was involved in cotton brokerage, was a land speculator, and was a partner in a stock brokerage firm in Charlotte. His overriding ambition was to establish a great network of railroads throughout the South much as the "Railroad Barons" of the North and West were doing. Since he lacked the funds to accomplish this, he engaged in nefarious financial and political transactions to acquire both money and support. If he had succeeded, he might have become one of the nation's wealthiest men; and once the memory of his deeds had faded, also highly respected. There were others in the nation who succeeded and their names came to be honored. Swepson's fate, however, was to be classified as "one of the greatest rascals of North Carolina history." When the Past Refused to Die: A History of Caswell County North Carolina 1777-1977, William S. Powell (1977) at 232-233. 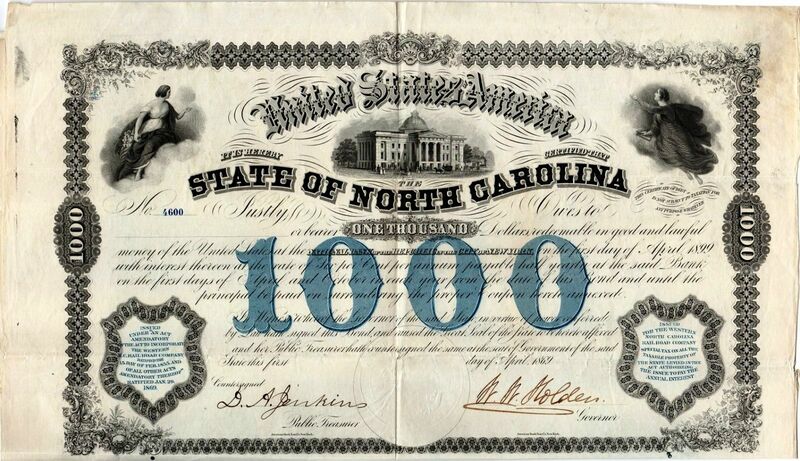 The principal railroad fraud and resulting scandal occurred 1868-1869 when the Republican North Carolina legislature issued a total of $27.8 million in railroad bonds. Swepson and Littlefield defrauded the state of an estimated $4 million in bonds that were intended for a western extension of the North Carolina Railroad. This delayed further western railroad construction until 1880, resulting in substantial economic loss to the region. Okay, so Swepson had lived in Caswell County at one time and went on to be known as quite a rascal. Why should those who study the history of Caswell County be that interested? It appears that most of his misdeeds occurred after he moved to Alamance County. Omitted from the brief biography given above is the identity of Mrs. George William Swepson. She was Virginia Bartlett Yancey (1826-1904), the youngest child of Bartlett Yancey, Jr. (1785-1828) and Ann (Nancy) Graves (1786-1855)! As some believe the Yanceys to be Caswell County's "first family" (or at least among them), this places the rascal Swepson in a different light. Moreover, his financial advisor and confidant in many of his swindles was Rufus Yancey McAden, a nephew of Virginia Bartlett Yancey. 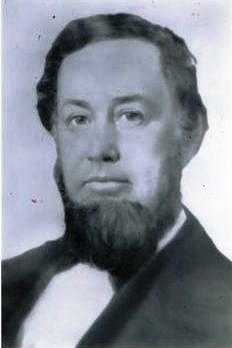 McAden was the son of Frances Williams Yancey (older sister of Virginia Bartlett Yancey) and Henry McAden. The McAden name also is highly respected in Caswell County by virtue of Reverend Hugh McAden, pastor at Red House Presbyterian Church. This Rufus Yancey McAden who assisted Swepson in his dealings was the great grandson of Reverend Hugh McAden! Rufus Yancey McAden was an orphan raised by his maternal grandmother, Ann (Nancy) Graves Yancey (mother of Mrs. George W. Swepson). He went on to become a prominent banker and industrialist. The town of McAdenville, North Carolina, is named for him. The town is known for its annual display of Christmas lights. Rufus Yancey McAden died as one of the wealthiest men in North Carolina. Thus, two prominent Caswell County families forever will be associated with George William Swepson. However, the railroad schemes do not tell the entire story. He, along with Milton S. Littlefield, was indicted for the railroad bond fraud, but was not convicted. Not known is whether Swepson even stood trial. Some historians believe the political influence of his wife's family contributed to this outcome. Swepson's tarnished reputation was further damaged in 1876, when he fatally shot Adolphus G. Moore in Haw River, Alamance County. Moore was a business partner (and brother-in-law) of Democrat Thomas W. Holt, who later became governor of North Carolina. Moore, also a Democrat, had once been arrested by radical Republican governor William Woods Holden during the Kirk-Holden War. The killing of Moore apparently was politically motivated, although there is no known record of an investigation or a formal conclusion to the matter. Again, Swepson was free. In Alamance County Swepson is viewed differently. Recognized as somewhat of a rascal, he also brought industry to the area and established the towns of Alamance, and Bellemont. The town of Swepsonville was named for the cotton mill Swepson built there in 1868. George William Swepson and Virginia Bartlett Yancey had no children. He is buried in Oakwood Cemetery, Raleigh, North Carolina, where his grave is marked by a very tall monument. Was George W. Swepson ever sorry for his misdeeds? Who knows. However, very late in life he apparently "found the Lord" and became a Christian -- a Baptist! His Baptist pastor was Thomas E. Skinner. The Reverend Skinner ran the blockade during the Civil War, among other things, to purchase Bible plates in England. He did this on the blockade runner "Advance." Guess who served on the "Advance"? Yes, the person was from Caswell County: John Baptist Smith. North Carolina Governor William W. Holden empowered Swepson, was a political ally, and remained a friend. Holden also was a member of the Raleigh Baptist church where Swepson found "salvation." What brought George W. Swepson to Caswell County, North Carolina? The earliest record of his presence there is the November 23, 1842 (bond date) marriage to Virginia Bartlett Yancey. Some claim he was a school teacher, but no record supporting that occupation has been found. Was he a person of financial means before relocating to Caswell County, or did this wealth come to him by marriage into the Yancey family? At the time of the 1850 US census, Swepson presumably would have been living in Caswell County for at least 8 years. Census records for 1850 shows him with real estate valued at $9,000, described as a farmer, and owning 24 slaves. How did he obtain this real estate and these slaves? Swepson's father was wealthy, owning 32 slaves at the time of the 1830 federal census. The father, William Mallory Swepson, died in 1835, and his will left all assets to his wife, but with the following provision: "with the privilege of giving off to my children as they marry or become of age such property as she may see cause . . . ." The will also provided: "[I]t is my will and desire at the death of my beloved wife Ann E Swepson, or upon marrying again, that my lands, stock, household and kitchen furniture and every thing lent her, except what she may have given off to her child or children, shall be sold except the negroes and the money arising from the sale and the negroes shall be equally divided between my children: Charity Ann Swepson, George W Swepson, Robert R Swepson, Martha A Swepson, and Mary E Swepson. Ann E. Swepson died the following year, 1836. Thus, George W. Swepson may have inherited substantial cash. Was this the financial basis of his various business ventures? But, why did take his cash to Caswell County? Geographically, Mecklenburg County, Virginia, is not far from Caswell County, North Carolina. The vote by Calvin Graves when he was Speaker of the North Carolina Senate during the 1848/1849 term broke a tie and passed a statute establishing an east-west railroad in North Carolina. His constituents in the Caswell County area were upset because they were in favor of a north-south railroad that, they hoped, would run through their section of North Carolina and stimulate commerce. Graves was in favor of extending the railroad to the west to further develop that less-accessible area of North Carolina. This vote ended his political career in Caswell County. Graves's fellow Caswellian and member of the North Carolina House of Representatives, Romulus M. Saunders, spoke against the bill with respect to which Graves broke the tie, voting in favor. "Speaker Graves calmly announced: 'The bill to charter the North Carolina Railroad Company and for other purposes is now upon its third reading. Is the Senate ready for the question?' Feeble responses said, 'Question.' The roll call began; and as feared nearly every Democrat voted 'No.' The tally was kept by hundreds, and when the clerk announced 22 yeas and 22 nays, there was an awful silence. The slender form of Speaker Graves stood up, and leaning slightly forward, with gavel in hand, he said: 'The vote on the bill being equal, 22 yeas and 22 nays, the chair votes Yea. The bill has passed its third and last reading.'" Source: "Party Politics in North Carolina, 1835-1860," Joseph Gregoire de Roulhac Hamilton (1916). Dictionary of North Carolina Biography, Volume 5 P-S, William S. Powell, Editor (1994) at 490. Arthur, J. Preston. (1914). Western North Carolina: A History from 1730 to 1913. Edwards and Broughton Printing Company. Blackburn, O. (1980). Western North Carolina to 1880. Appalachian Consortium Press. Carson III, H.S. (2005). Penal Reform and Construction of the Western North Carolina Railroad 1875-1892. Journal of Appalachian Studies, 11(1/2), 205-225. Helper, Hinton A. (1886). Western North Carolina: nature's trundlebed of recuperation for tourist and health seeker. New York South Pub. p9-32. Kickler, Troy L. (2012). North Carolina Railroad. The North Carolina History Project. Online Article. Retrieved November 4, 2012 from http://www.northcarolinahistory.org/encyclopedia/34/entry.